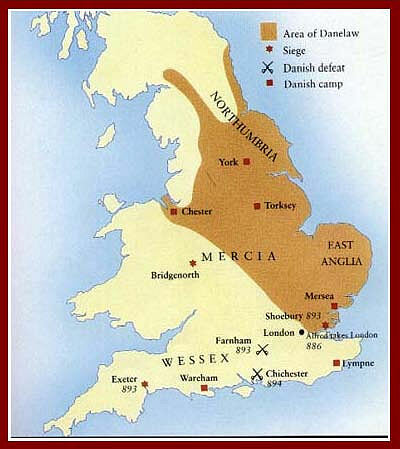 Mercia is the Anglo-Saxon Kingdom south of the Kingdoms of Northumbria and Cumbria. It is possible that some sub-Roman British Christian communities survived the invasion of the Anglo-Saxons; but apart from that Mercia remained pagan till 7C. Paeda, the son of Penda the pagan king of Mercia, was a sub-king of the Middle Angles in East Mercia. In 653 He sought the hand of Alchfled daughter of King Oswiu of Northumbria. A condition of the marriage was that Paeda became Christian. Oswiu sent 4 priests from Lindisfarne to Mercia with his daughter: St Cedd, St Betti, Diuma and Adda. 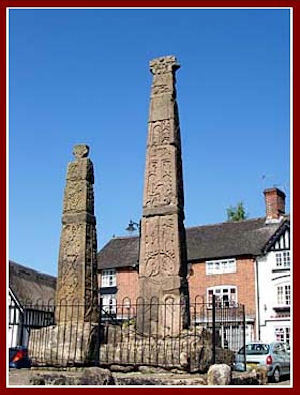 There is a tradition that they baptised him at Sandbach in Cheshire where crosses were erected to commemorate the event. Diuma became Bishop of the Mercians in 660. The monastery lay just north of Stowe Pool where the present Church of St Chad now stands. 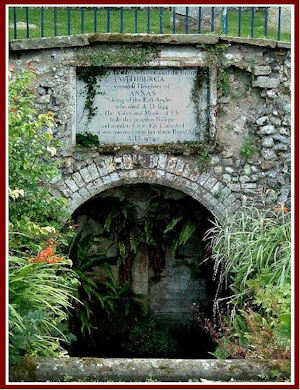 The holy well was used for baptism. He also obtained land to found a monastery at Barrow in Humber. St Chad carried on very much in the style of St Aidan and St Cuthbert. He died of the plague in 672. His relics were rescued from the Reformation and are now in the Catholic Cathedral in Birmingham. Peterborough, (Medeshamstede) a strategic centre in the East of Mercia, also had became one of the first centres of Christianity in Mercia. Paeda provided for the foundation of the monastery in 655. St Betti evangelised the area around Wirksworth in Derbyshire. He died about 670 and is buried beneath the chancel. 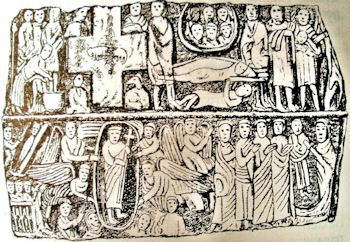 His coffin lid has been found decorated with scenes from the life of Christ. 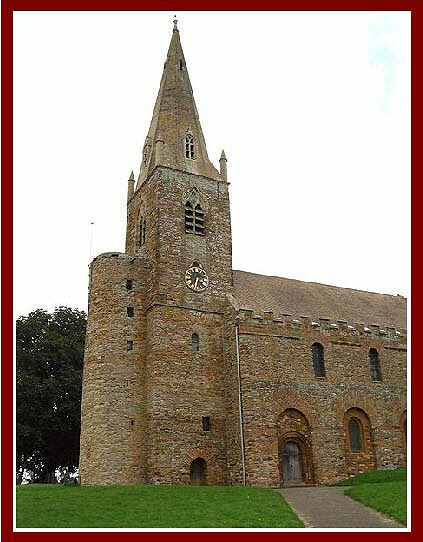 St Wilfred, at a time when he was unwelcome in Northumbria, from 660 onwards, founded monasteries in Mercia: at Oundle and probably Brixworth (above), both in Northamptonshire. He went even further afield making foundations al Evesham in Worcestershire, Wing in Buckinghamshire, Withington in Gloucestershire, and Selsey in Sussex. 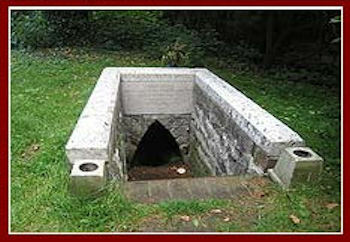 A Saxon crypt is still preserved at Wing. 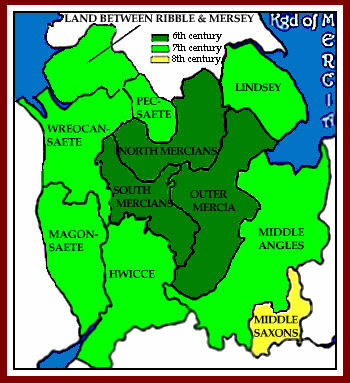 King Ethelred, the next king of Mercia, controled Lindsey -present-day Lincolnshire. 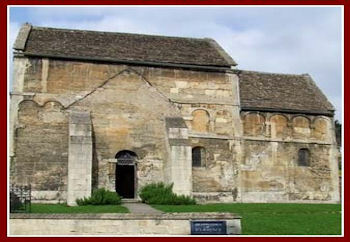 He endowed the monastery of Bardney on an island in the marsh east of Lincoln in 697. He abdicated and became the first abbot. Ethelred was married to Osthryth, the daughter of King Oswiu of Northumbria and uncle of St Oswald. They gave relics of St Oswald to the monastery and were themselves enshrined there Another monastic foundation was made at Partney. St Aldwyn was abbot there and his brother St Ethelwine (Elwin) (700) was the second Bishop of Lindsey. St Hybald is described by St Bede as ‘a most holy and austere’ man. He was a close friend of St Chad and may have been a monk in the Irish tradition at Iona and Lastingham. He may have founded his own monastery at Hibaldstowe in north Lincolnshire on an island in the marshes close to the Humber. No trace of it remains, as it was probably made of wood. 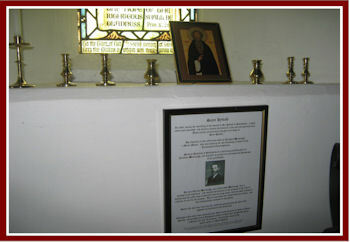 St Hybald was buried in Hibaldstow church. A large stone coffin was found under the floor of the chancel in 1866 complete with skeleton. It is likely this is the coffin of St Hybald and reburied when the new floor was relaid. 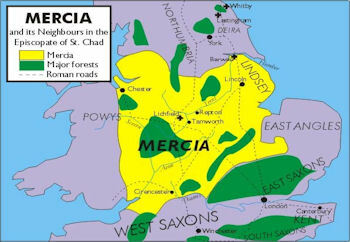 Expansion of Mercia into Greater Mercia in 7/8C. The pattern in Mercia was the same as in Northumbria: Kingdom and Church developed together and royals provided for monasteries. At the other end of the spectrum were always the hermits. 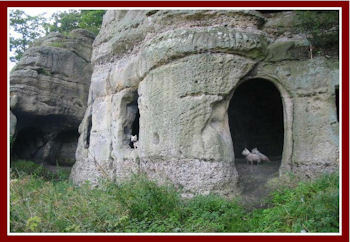 St Hardulf (7C) is said to have used the cave known as the ’Anchorite’s church’ near Ingleby in Derbyshire. He was buried at nearby Breedon. 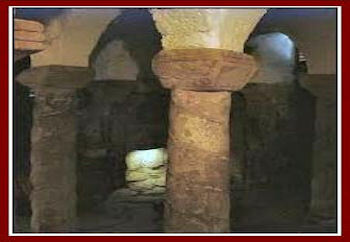 The cave was also used by a monk called Bernard in mediaeval times. 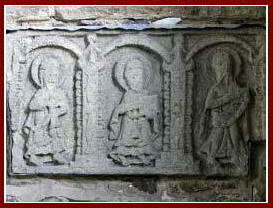 Some splendid 8-9C Saxon scultures can be seen inside the church at Breedon. Tatwine (734), the future Archbishop of Canterbury, was a monk here. There were three other saints besides St Hardulf buried, perhaps hidden away in a crypt. Repton in Derbyshire was the site of another double monastery of royal foundation and ruled by an abbess. St Werburga (699), daughter of King Wulfhere of Mercia, is the first recorded abbess of Repton. She was taught by St Etheldreda at Ely. 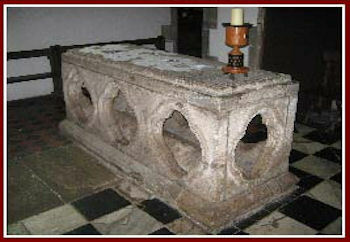 She was buried at Hanbury in Staffordshire, her body later found to be intact. But in 9C her body was moved to Chester to escape the Danes. St Osburga founded a convent at Coventry in the West Midlands about 700. The Irish St Modwenna founded a convent at Burton-on-Trent, Staffordshire in 7C. St Cyneburg (710) and St Cyneswith founded a monastery at Caistor in Lincolnshire. 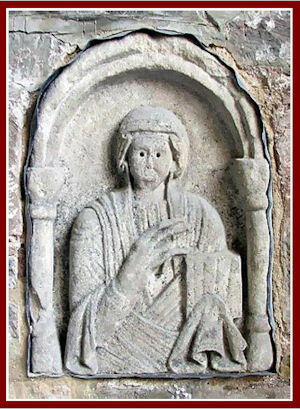 St Edburga (7C) was a daughter of King Penda of Mercia, who became a nun at Bicester, Oxfordshire. 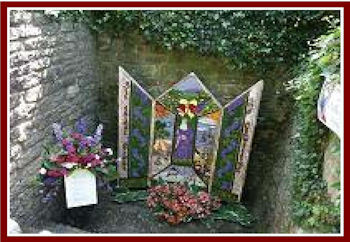 The base of her shrine can still be seen in Stanton Harcourt St Egwin, the third bishop of Worcester founded the monastery at Evesham about 709. He is buried there. 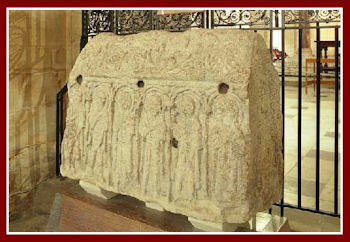 St Etheldreda (Audrey) was the daughter of King Sigebert and was baptised by St Felix. After 2 non-consummated mariages she became a nun at St Ebbe’s monastery at Coldingham. She returned south and founded the monastery of Ely. She died in 679. St Sexburga, her sister and next abbess organised a new shrine for her. 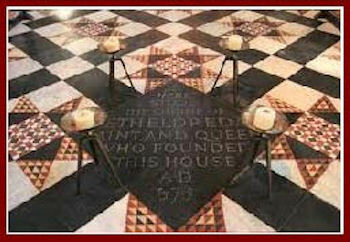 In the Cathedral, an inscription on the floor marks the site of the shrine. In the painting a red wound is show on her neck where a tumour was removed from her neck. When her body was exhumed 17 years later the wound made by surgery had healed. St Guthlac was a Mercian royal who became a monk at Repton, and then a hermit on the isle of Croyland in the fens in Lincolnshire. An abbey arose there after his death in 714. St Cissa joined him and succeeded him. They were buried side by side. St Pega (719) was St Guthlac’s sister. She also became a recluse at nearby Peakirk. There is an 11C church there with mediaeval wall paintings. St Aelfthryth was a daughter of King Offa of Mercia who became a virgin recluse in the marshes of Crowland Abbey. She died about 795. St Milburga’s Holy Well Much Wenlock, Shropshire. She was sister to Mildrith, a nun at Minster in Thanet, and to St Myldgitha, a nun in Northumbria. St Alcmund was a Northumbrian royal. A good man, he died in battle about 800 and was regarded as a martyr. He was buried at Lilleshall in Shropshire but, due to the Danes, his body was moved to Derby. His sarcophagus was found when building roads; it can be seen in Derby museum. 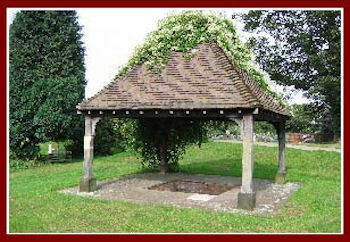 There is also his holy well in Derby. The Kingdom of East Anglia was formed in 520 by uniting the North and South Angles. The height of its power began after 616 when the Northumbrians were defeated. But the Mercians defeated the East Angles in the 640’s and King Offa of Mercia took control in 794. St Sigeburt became the first Christian king of the East Angles about 630. He had met St Felix when in exile in France and invited him to evangelise in his Kingdom. 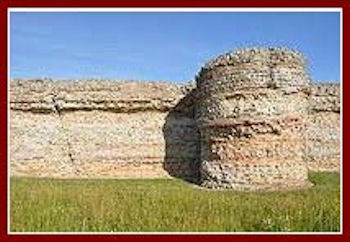 The Irish St Fursey made a monastery probably at Burgh Castle near Great Yarmouth. The Irish St Gobain helped him. St Sigebert (635) became a monk and refused to fight to defend the kingdom and is regarded as a martyr St Botolph (680) built a monastery at Ikenhoe on the river Iken in the estuary of the river Alde. A fine cross shaft remains. The Kingdom of Essex was formed in 527 to the south of East Anglia. It lasted until 825 when it was ceded to Wessex. King Saebert became a Christian with encouragement from his uncle King Ethelbert of Kent, though the kingdom relapsed into paganism. 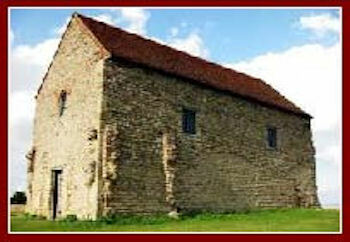 St Cedd founded monasteries at Tilbury and Bradwell-on-sea. The Mercian King Wulfhere became overlord and sent one of his bishops to reconvert them. St Erconwald became bishop of London in 675. He founded a monastery at Barking for his sister St Ethelburga, and another at Chertsey in Surrey for men. Wessex was the kingdom of the west Saxons in south west England from 6C on. Settlements of Jutes on the Hampshire coast were acquired in 7C. St Birinus, a Frank, was commissioned by the Pope to convert the West Saxons in 634. He baptised King Cynegils about 640. He became bishop of the West Saxons at Dorchester-on-Thames. St Oswald of Northumbria acted as god-father. The Kingdom expanded westwards into Somerset. Later Devon and Cornwall were taken, though areas north of the Thames were lost to Mercia. Winchester became the seat of the bishop. Wimbourne became the great centre for evangelism in Germany. St Boniface’s mission was supported by St Walburga and St Leoba and by St Walbuga’s two brothers St Willibroord and St Winibald. This was he second great wave of missionaries to the continent from Ireland and Britain, and as such an outstanding contribution to the Living Tradition. The Irish St Maeldub (675) lived at Malmesbury (named after him). St Aldhelm lived as a monk under him, became abbot and founded monasteries at Frome in Somerset and Bradford-on-Avon in Wiltshire. He was also a great scholar, writing works in both prose and poetry. He also became the first Bishop of Sherbourne in 705. He was revered as a saint after his death. He was deputed to bring about a change in customs in the British churches of Devon and Cornwall. 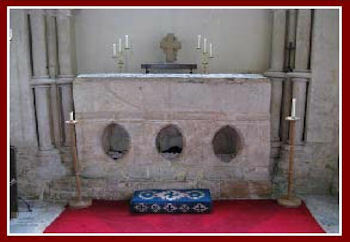 St Bertwald was made the first Anglo-Saxon bishop of Glastonbury in 667. St Richard was a minor king in Wessex in 8C but he abdicated his throne to go on pilgrimage on the continent. He was the father of the great continental evangelists, St Willibrord, St Willibald, St Winibald and St Walburga. He died in Italy. St Wite’s (9C) shrine in Whitchurch Canonicorum. The first Council of Clovesho, in 742, "diligently enquired into the needs of religion, the Creed as delivered by the ancient teaching of the Fathers, and carefully examined how things were ordered at the first beginning of the Church here in England, and where the honour of the monasteries according to the rules of justice was maintained". St Ethelhard, abbot of a monastery at Louth, Lincolnshire, was made Bishop of Winchester sometime after 759, and Archbishop of Canterbury from 793-805. Lichfield had been set up as a rival to Canterbury at the request of King Offa of Mercia, so there was much debate as to which was the greatest. At the fifth Council of Clovesho in 803 it was decreed that there should not be another archiepiscopal see in the south to rival Canterbury. It was also decreed that every bishop elect should submit a profession of orthodoxy. The seven Councils of Clovesho held between 742 and 825 show an impressive will in the Anglo-Saxon Church and in its Kingdoms to work together to maintain true faith and good order. 800. But by 865 some of them began settling in northern and eastern England, in an area ruled by the ‘Danelaw’ and included, in the East Midlands, Derby, Leicester, Lincoln, Nottingham and Stamford. St Edmund became King of East Anglia in 856. The Danes put him to a cruel death in 869. Within a generation the Danes were venerating him as a saint. 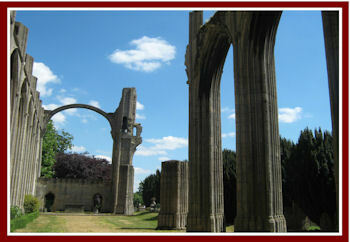 A shrine was built at Bury St Edmunds and the town grew as a place of pilgrimage. The Danes, as a deliberate act of aggression, wiped out every monastery in the land. That is why there is now so little left to see of this period. This is not the first time the Living Tradition has been blotted out by war. This happened for example to the church in North Africa.